For the first time since our model launched, last week’s forecast saw Labour become very slight favourites (51-49) to win the most seats at next May’s General Election. A slight improvement for the Conservatives in the polls (they’re up 2 since last week in the UK Polling Report average, with UKIP down 2 and Labour and the Lib Dems unchanged) puts them back in front this week – but only just. The model now gives them a 56% chance of emerging as the largest party, to Labour’s 44%. 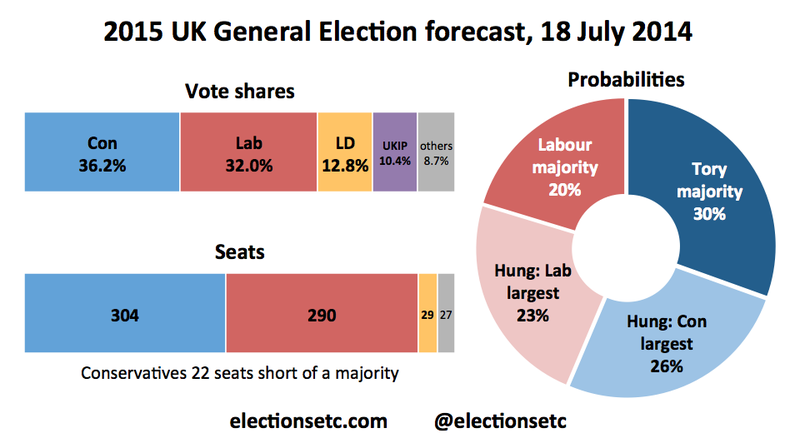 The central forecast is still for a Hung Parliament, with the Tories on 304 seats and Labour on 290 (with 326 needed for a majority). The model continues to make a Hung Parliament a roughly even-money bet – giving it a 49% chance this week. Stephen, I have visited your old page countless times today to try to see your forecast update. I only discovered this website almost completely by a chance this evening. I would suggest putting a very clear link on your old page.